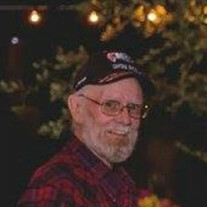 Laurence Edward Shannon, 76, of Apple Valley, Calif. formerly of Hannibal, Mo. passed away at 5:00 a.m. Friday, December 2, 2016, with his family at his side. A private family graveside service will be held at a later date at Hydesburg Cemetery in rural Hannibal. Laurence was born on June 6, 1940, in Hannibal, Mo. the son of Cecil and Emma (Long) Shannon. He was married to Patricia Ann Hall on August 5, 1960, in Ontario, Calif. She preceded him in death on August 9, 2011. Survivors include two daughters Carrie Foster and husband Gary of Apple Valley, Calif. and Tammy Hebert and husband Mark of Peoria, Ariz.; four grandchildren, Katie Aubel (Scott), Kelley Foster, Elizabeth Schneringner (Tom), and Michael Hebert (Jaicey); and two great grandchildren, Nicholas and Madison Aubel. Mr. Shannon was preceded in death by his parents and wife. Laurence was a truck driver professionally for over 37 years. He was a member of the Hannibal Amateur Radio Club he also enjoyed drag racing in the sand dunes in California. When he wasn't racing Laurence could be found playing a round of golf or just sitting back watching a football game. His greatest enjoyment was spending time with his family especially his grandchildren and great grandchildren.